Over the past year, I’ve been fortunate to talk with Tony Hsieh (Zappos CEO) and Alfred Lin (Zappos COO/CFO), about ways that Zappos grew its culture and its phenomenal customer service. Most people don’t know that Zappos had a very turbulent history when it was founded, or about the many personal sacrifices that Tony Hsieh (and early Zappos employees made) to help Zappos achieve such extraordinary success and $1 billion dollars in revenues in fewer than 10 years. 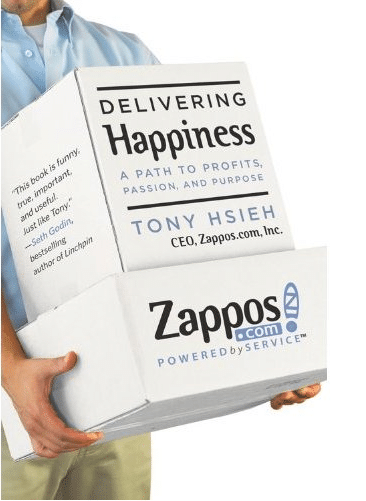 Delivering Happiness, by Zappos CEO Tony Hsieh, contains many important lessons for entrepreneurs, small business owners, and anyone who wonders whether a company’s culture can be the foundation for commercial success. The book is part autobiography of Tony Hsieh (covering his childhood, college years, work experience and startups prior to Zappos) and part a story of how Zappos was founded and how it became the success it is today. Tony was an entrepreneur from the time he was a child – starting numerous small businesses, including an earthworm farm (failed), mail order magic kit business (failed), and a few other small ventures. None of those early failures deterred Tony from pursuing more entrepreneurial ventures, culminating in a $265 million sale of his startup Link Exchange, to Microsoft, in 1998. It’s clear that happiness has always been important to Tony. Microsoft’s purchase of Link Exchange meant that Tony wouldn’t ever need to work again in his life, and if he stayed at Microsoft for at least one year following the purchase, he could make even more money. If I stayed the entire time [12 months], then I would walk away with close to $40 million. If I didn’t, then I would have to give up about 20 percent of that amount … A few days later, I went to the office, sent my gbood-by e-mail to the company, and walked out the door. I didn’t know exactly what I was going to do, but I knew what I wasn’t going to do. I wasn’t going to sit around letting my life and the world pass me by. People thought I was crazy for giving up all that money. And yes, making that decision was scary, but in a good way. I didn’t realize it at the time, but it was a turning point for me in my life. I had decided to stop chasing the money, and start chasing the passion. My plan was to take almost everything that I had left in my name and liquidate it in a fire sale. I would bet the farm and put all the proceeds into Zappos. To an outsider, it may have seemed like a desparate and reckless plan. It certainly was desperate, but the end result made it worthwhile. As many of you know, Zappos was acquired by Amazon in 2009 for $1.2 billion (the value of Amazon stock pledged for the purchase, on the day the transaction closed). Bottom Line: Delivering Happiness is an outstanding book for anyone who wants to better understand the turbulence of a startup and the effort and personal sacrifice needed to succeed. The book also offers many lessons about building a company’s culture and the tremendous advantages that good culture (and happiness) can bring to a company struggling to survive. The business concepts in the book aren’t unique, but the stories are relevant and contain many important lessons for startups, small businesses and even large companies who are focused on differentiating their products and services.